Walter C. Ibele II of Canfield, Ohio, died at age 90 on February 9, 2019. He was born in Cleveland, OH, to the late Walter C. and Augusta (Mounts) Ibele. He graduated from Salem High School (1946) and the University of Cincinnati with a degree in Metallurgical Engineering (1952). While in college, he met his wife, Marlyn, to whom he was married for 64 years, until her passing in June 2018. Walter attended college on a scholarship from Mullins Manufacturing Corporation of Salem and worked internships with the company. After graduation he served a commission as 2nd Lieutenant in Army Ordinance via the ROTC program until called to active duty in the Korean War armory in 1953. After being discharged from the military in 1955, he started a long career in the steel industry. Walter began work as an engineer, and later in numerous supervisory and management positions for Youngstown Sheet & Tube, Lykes Corporation, LTV Steel, and Jones & Laughlin Steel. Walt retired from the steel industry in 1985 and then worked as a consultant for several years thereafter. Walter was member of numerous professional societies including the American Iron & Steel Institute (AISI), the American Institute of Mining & Metallurgical Engineers (AIME), the American Society of Metals (ASM), the Association of Iron & Steel Engineers (AISE), the National Management Association (NMA), and the Mahoning Valley Industrial Management Association (MVIME). Walter was also a registered Professional Engineer in the branch of Metallurgical Engineering in the State of California. 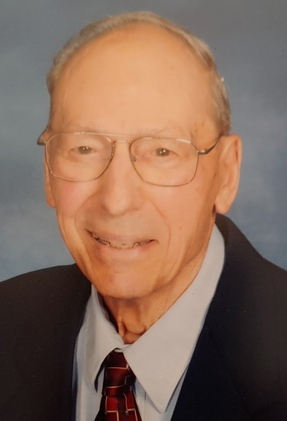 Walter was a fourth-generation member of the First Christian Church of Salem for 80 years and served in numerous leadership positions in the church. Walter was also active with the Boy Scouts, first as a member of Boy Scout Troop #5, and later-- as assistant scoutmaster—he helped restart the troop after WW2. After returning from his military service in the Korean War, he was an active leader of Troop 71 of Ellsworth and Troop 115 of Canfield. At Walter’s passing, he was the most-tenured member and former president of the Canfield Conservation Club. He was the founder of the Mahoning Valley trap league and president of the league for its first 25 years. Walt could be found at weekly trap shoots as recently as October 2018. Walter’s favorite conservation charity was Ducks Unlimited (DU), in which he has held membership since 1980. He served many years as Banquet Chairman and committee member of the Mahoning Valley Chapter of DU. Walter’s community activities included several years on the local board of the American Cancer Society, representative of both the Canfield and Mahoning Valley Fair Housing Board, and board member of the Dyslexic Children’s Center in Youngstown. Walter’s Masonic affiliations include memberships in the Perry Lodge F&AM #185 of Salem; Scottish Rite bodies, Valley of Albany, NY, the Al Koran and the Youngstown Shrine Club. In the Shrine Club, he served as Director of Transportation and driver for over 200 trips to transport children to Shriners hospitals in Erie, PA, and Cincinnati, OH. Walter loved the outdoors and was an avid, lifelong fisherman and bird hunter and made numerous sporting trips with family and friends. Walter also loved dogs and during his lifetime his canine companions included beagles, pointers, labs, golden retrievers and numerous adopted mixed-breeds. Walter was preceded in death by his wife, Marlyn, and sister, Mary Ibele-Emler (Salem, OH). Walter is survived by his three sons Walter Clinton III of Kentucky, Lyndon (Janyce) of Alaska, and Daniel (Erin) of Michigan; grandson, Daniel of Michigan, granddaughter, Aubrey of Colorado; and cousins, Robert (Grace) Zimmerman, Debbie (Darryl) Miller, Mark Zimmerman, Mary Jane (Dennis) Weaver, and Rick (Melody) Mercer. A memorial service will be held at 11:00 a.m. on Friday, February 15, 2019 at the First Christian Church of Salem with Rev. Leonard Moore officiating. Calling hours will be held from 9:00-10:30 a.m. Friday at the church. In lieu of flowers, contributions may be made to Ducks Unlimited, One Waterfowl Way, Memphis, TN 38120 or The First Christian Church, 1151 E. Sixth St., Salem, OH 44460.